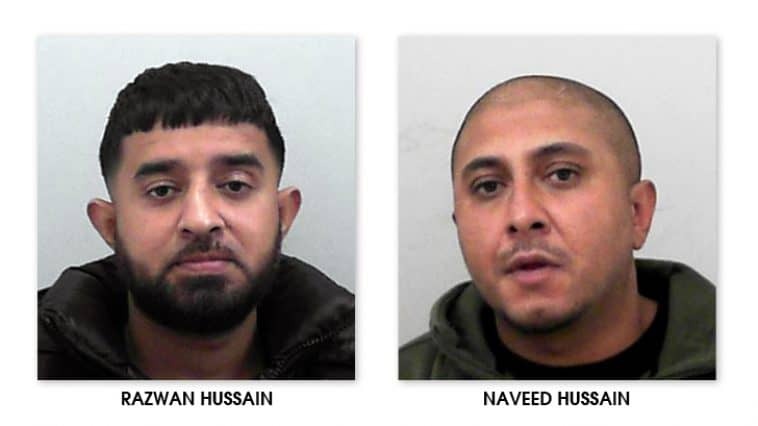 Razwan Hussain, 34, and his 36-year-old brother Naveed, both of St Marks Road in Bristol, were jailed for 10-and-a-half years and two years respectively at Bristol Crown Court earlier today. They attacked a 44-year-old man and a 21-year-old man at the Tesco Extra store in Eastville at around 6.30pm on Friday 31 August. Both victims were left with serious injuries. Part of the incident was captured on CCTV (see below – please be aware you may find the footage distressing). Following the sentencing, Chief Constable Andy Marsh praised the bravery of members of the public who rushed to the aid of the two victims and the professionalism of officers who were first on the scene. He said: “This was a cowardly and brutal attack which took place in a busy superstore on a Friday afternoon last summer. “It’s a concerning example of a violent offence which we believe has its roots in serious criminality. “I’ve watched CCTV showing the incident unfold as well as Body Worn Video footage of officers who were first on the scene and it’s shocking. “The use of such a barbaric weapon in such close vicinity to so many innocent members of the public is horrifying and I’m sure these events will have a lasting impact on those who were unfortunate enough to witness it. “I want to praise the bravery of the members of the public who rushed to the victims’ aid and the actions of staff at the store who evacuated shoppers so quickly. “Body Worn Video footage (below – please be aware you may find the footage distressing) shows the response of officers who were first on the scene and they acted with calm professionalism, swiftly taking charge in what were chaotic circumstances. I also want to praise everyone involved in the search for the offenders and those who worked on the resulting investigation. Investigating officer DC Dominic Landragin said the machete attack unfolded a short time after Naveed Hussain and one of the victims were involved in a scuffle inside the store. He said: “After the initial disturbance, CCTV shows Naveed Hussain using his mobile phone to summon help, resulting in his brother Razwan driving to the store armed with the machete. “One of the victims was attacked just outside the foyer, while the second victim was pursued through the store and then struck with the weapon. “We were quickly able to identify the Hussain brothers from CCTV footage and an intensive search operation began. Armed officers were involved in this operation due to the nature of the incident. “Razwan was arrested a week later after being found by officers hiding at a relative’s home, while Naveed handed himself in after five days. “The video footage speaks for itself and both brothers had to admit their guilt due to the overwhelming evidence against them.